Sound Transit recently held an open house on Mercer Island to discuss some updates to the Mercer Island Link station. I wasn’t able to attend, but the materials are available online. The meeting focused on two updates to the station design for riders arriving by car or by bus. First, ST is considering a second parking lot near the community center to handle overflow traffic from the always-packed Mercer Island park-and-ride. Many Mercer Island residents have been adamant that they will only use the station if they are given ample, free parking, and ST is working to find ways to accommodate them. Second, staff showed a new concept for handling buses. We’ve known for a while that Sound Transit plans to remove the bus ramps at I-90 and Rainier, meaning that all Seattle-bound riders in the I-90 corridor will be transferred to Link, either at Mercer Island or South Bellevue. Therefore it’s important that the bus connection at those stations is as painless as possible (see Adam’s posts here and here for more on good and bad bus-rail transfers). Previous concepts for bus transfers at MIS involved a loop through the neighborhood before returning to I-90, not too different from today’s configuration. Neighborhood feedback sent those concepts back to the drawing board, and everyone is better off for it. Since buses will no longer continue on to Seattle, the whole configuration can be rethought around the new goal of providing a great transfer experience. The latest setup converts 80th Ave, which straddles the freeway and is adjacent to the Link station, into a transitway. Buses will exit the Westbound HOV lane, drop passengers off in front of the station, and get right back on the freeway going the other way, like a bucket brigade. Riders will be deposited directly atop the escalator for the Link station. This should make for very smooth bus-rail connections. By planning for the connection at this early stage, Sound Transit has created a much improved rider experience. So will all existing I-90 buses take advantage of this new transitway? It’s not clear yet. The diagram above mentions two lines in particular, ST 554 and Metro 216. I asked Metro’s Jeff Switzer why those routes were singled out, since there are many more that will be affected when buses no longer go past Mercer Island, and he said that while “the legend does not accurately reflect the specific routes” and would be corrected, Metro consulted with ST to provide low- and high-end estimates for the number of buses that would serve the station into the future. In other words, the service concept was vetted against current and future demand, but the routes themselves are still TBD. Switzer added that no decisions have been made with respect to specific service changes on I-90 once East Link opens, and that a robust public outreach process would be included as the opening day got closer. One can imagines a similar process to the recent ST/Metro U-Link workshops occurring sometime around 2020. This will be a great opportunity to re-think the Eastside network all-up. If one-seat rides into Seattle are no longer be possible via I-90, those buses might be re-configured as all-day connectors to Link stations and other regional destinations, providing enhanced regional mobility. I can hear the responses coming to what I’m about to write, but here goes. The current 554 (Issaquah + Eastgate) loses its one seat ride to downtown in favor of a pretty good transfer, but still a transfer. In order for this to be palatable, ST3 needs to include some work on this route. Either a spur of Eastlink that serves Issaquah and Eastgate or at minimum, some improvements to the 554 routing and other improvements to shave off some time off the route. Unfortunately there’s not much else to do. The route is already running most of the time on the freeway in HOV lanes that are usually not filled to capacity. I agree that better rail options for the Eastside need to be reviewed and hopefully included in ST3. That said – Even with a rail extension to Issaquah, it is unlikely to be a 1 seat to DT Seattle and, Unfortunately, the short and more likely version of an ST3 extension (terminating at Eastgate) would make Issaquah a three seat ride to DT Seattle. ST has been very vocal about not adding lines into the DT tunnel. Outside of that – The primary driving issue here (apart from saving service hours) is that a lot of buses will have to be kicked out of DT Seattle *regardless of what service people would like* when the DSTT closes to buses. I think Issaquah riders are in for transfers for a very long time. S. Bellevue Station will have a center platform, so that transfer won’t be much of a nuisance. The real nuisance factor is how hard it will be to get between Issaquah buses and Bellevue College Station. Issaquah deserves to get a train line some day, for all the densification they are doing at levels that neighbors around Central Link are fighting. I agree. This is a key thing to consider when it comes to spur lines off of East Link. Basically, they won’t go to downtown Seattle. The bridge crossing limits the headway towards Seattle, and there is no way they are going to lower the frequency for Bellevue/Redmond to Seattle trains so that they can accommodate Lake Sammamish/Eastgate/Issaquah riders. So, as Keith said, it would be a three seat ride if light rail got to Eastgate (and the buses turned around there instead of at Mercer Island). Even if light rail got to Issaquah, the vast majority of riders would have a three seat ride. It is simply impractical, if not impossible to serve all of the various locations on the east side (e. g. Lake Sammamish, Highlands, etc.) with one rail line. The 554 is a great example of that — there is no way a rail line could reach all the stops east of Eastgate unless enormous amounts of money were spent. Even those that favor Issaquah light rail know this. 1) Add HOV lanes on the surface streets. I’m not sure how practical or expensive this would be. 2) Signal priority on some of the intersections. 4) Add another transit station along I-90, at the state route 900 interchange, or a little to the east. This would be the most expensive and most complicated solution, but it would solve the transfer problem quite nicely. In other words, someone from the Highlands would take the express that would make a stop at this station, then take a different bus headed the other direction (perhaps a different express). This basically moves the transfer point about 5 miles to the east (from Eastgate to state route 900). I kind of doubt this makes sense, but it is worth considering. I really don’t know how good the local service is in Issaquah, but my guess is the local connections can simply be solved by better local bus service. It may be that even if building this station was cheap, riders might object to this extra stop if very few people transfer here (and unlike Eastgate, which is fairly close to the college, there is very little that is close to here). RossB is right to have the best possible interim connection on Issaquah Link, as part of ST3. But take a trip out to Issaquah Highlands P&R, and then try telling anyone that Sammamish is a major destination comparable to it. They are orders of magnitude apart. What the 554 really needs is not so much speed improvements, but more frequency. It’s the wait time, not the ride time, especially for the train->bus connection in the outbound direction, that’s going to be the issue. In terms of speed, the 554 actually does pretty well. It has an HOV lane from Mercer Island to Issaquah. We already have an HOV lane between Mercer Island and Issaquah, a bus-only lane down the exit ramp to Issaquah, an HOV lane along the entrance ramp from Issaquah, and clear signal priority for the left turn from SR-900 to the transit center. Within Issaquah, there really isn’t that much congestion, so there’s not much need for capital improvements. I still think the 554 should have a stop as it goes by the shopping center with Target and Safeway, but that’s just a pole with a sign sticking out, way cheaper than a rail line or dedicated busway. The only time the speed of the 554 becomes an issue is for people riding it all the way to the highlands or to Sammamish. Such people exist in negligible numbers outside of rush hour, so simply giving them their peak-hour Issaquah Bypass Express is the simplest and cheapest solution. @asdf. Almost exactly my thoughts. Probably a good strategy is to keep the full routing during peak times, and have it truncated at a link station (probably south Bellevue) off-peak. But if it’s going to be truncated at Mercer Island, then it seems a little ridiculous not to make it go all the way to Seattle since it’s almost there. It would seem silly in that case to forgo the last 3 miles or so across the water on a service hour efficient freeway to go where most probably every single rider on that bus is going anyway. At what cost? The 554 is currently scheduled at 20-25 minutes between MI and its terminal downtown in both directions. Add a half hour layover and that’s over one platform hour for each trip you send downtown. Maybe it would be a better use of those hours to extend the route at the other end to serve Sammamish more regularly. Yes, what aw said. This is true throughout our system. Riders from Maple Leaf (on the old 73) will have to transfer at the U-District to go downtown. Riders from Lake City (on the old 41) will have to transfer at Northgate (or 125th/130th NE if a station is built) to go downtown. The trade-off is that buses can travel much more often at no additional cost. This gets into destinations at the transfer point. If you have to transfer at Roosevelt or Northgate, no big deal because you can catch up on errands or refreshment if you have to wait a while, and half the time it will be your destination anyway. But between Mercer Island and downtown Issaquah, the stations are in the middle of nowhere (the long walk to Bellevue College or Factoria aren’t really close enough if you’re just transferring through). The only way to mitigate this is to ensure that nobody waits more than 5 or 10 minutes for a bus. Just going through downtown during rush hour is already 25-30 minutes. Add the inevitable backup at the exit ramp when the current ramp becomes train-only, and things will only get worse. It makes far more sense for everybody, to just make the transfer in exchange for a faster and more reliable path through downtown – especially during the peak, when both bus and train will be running at their maximum frequency. I don’t see how you could make meaningful improvements to the 554 without a ton of money. There’s no ROW to be had on Sunset Way or Newport Way in Issaquah. SR 900 already has HOV lanes. Once you’re on I-90, you’re in the HOV lanes and it is pretty quick until you get to Mercer Island. The 554 today has a scheduled travel time between 14-22 mintues between Mercer Island and 4th and Pike, depending on time of day. East Link will be 14 minutes from Mercer Island to Westlake. It would be quite easy to make the 554 a timed transfer to East Link and minimize the transfer penalty. Save the service hours the 554 uses getting into/out of downtown Seattle and use them to increase service on the 554 or 555/6. Will the 555/556 still exist after East Link opens? I can’t see an express bus service duplicating Link from UW Station to Northgate Station. The 271 serves southeast and northwest Bellevue better. Eastgate and Issaquah to UW would be via the 554 and Link, with that awesome connection at MI Station. Role service hours into the 271 and 554, to have the 554’s frequency match East Link all day. That’ll draw ridership far more than shaving a couple minutes off of travel time somewhere. It’ll also make up for the back-track time for 554 riders headed to downtown Bellevue. There’s a reasonable argument to be made that with East Link, you should delete the 554 and make the 555/556 all day, probably with a truncation at Montlake. This gives you a direct express between Issaquah-Bellevue and between Bellevue-U District, as well as Issaquah-U District. Anyone heading between downtown Seattle and Issaquah can transfer at South Bellevue. Issaquah-U District would be faster on the bus due to the transfer penalty; the scheduled time from South Bellevue to the U District is close to a wash for the train and bus (~40 min), although at peak the transfer to Link might be faster. The 271 would remain to provide local service the 555/556 doesn’t. You could easily add the 554’s downtown Issaquah routing in to retain service there, although that comes with a time penalty between Bellevue and Issaquah over today’s 555/556. I would like to see a comparison between using S.Bellevue as a transfer point or Mercer Island. Personally, I think that S.Bellevue would be a better place, because the transfer possibilities at S.Bellevue are much better. For example if you’re going Issaquah -> Renton, you could take the 554 to the 560 by transferring at S.Bellevue. The only other route that serves Mercer Island is the 204, which I’m willing to bet has fewer riders than the various busses at S.Bellevue, which currently are: 241, 249, 550, 555, 556, 560 (although likely some of those routes would be revised after East link). I would imagine the only reason to go to Mercer Island though is because of a time penalty. We’d have to see exactly what the time penalty is — if it’s 2 minutes then I think the better connectivity of S. Bellevue is worth it. If it’s like 7 minutes, then I think the benefit isn’t worth the additional tax on Eastgate/Issaquah riders. Why not improve the span of service for the 555/556 and have those routes stop at S. Bellevue station? The 554 could continue to serve M.I. for a better transfer to Link for downtown-bound riders. Today, without traffic, the time penalty for getting to Mercer Island is ~2 minutes westbound. There is no time penalty eastbound due to the light leaving South Bellevue P&R. Part of the reason for favoring Mercer Island is that it has HOV direct access ramps, while there are none to/from the east at Bellevue Way. ST and KCM aren’t enthusiastic about having buses merge across the entire freeway to get between the exit and the HOV lanes. That isn’t an insurmountable problem, but it is a legitimate concern. High end estimates are for 84 buses per hour in the peak of peak, meaning a bus every ~40 seconds; that’s a lot of buses to be changing lanes, and even if the chance of an incident with any single bus is minimal, it adds up. The intention is to used timed transfers for eastbound service, so at Mercer Island the bus loads and then has a straight shot onto the HOV lane. At South Bellevue, the bus loads and then waits for the light to turn left onto Bellevue Way. At 84 buses per hour, transit signal priority would probably have the effect of nuking through traffic on Bellevue Way in favor of turning movements for buses serving the station. While this may be an acceptable tradeoff to many here on STB, I doubt the City of Bellevue would be that thrilled. Travel time and reliability is therefore an issue at South Bellevue, and less of an issue at Mercer Island. In informal conversations with staff, the current thinking, such as it is, is for I-90 routes to use Mercer Island with a consolidated service pattern. You’d have routes going to Sammamish & Issaquah Highlands, Issaquah, and possibly North Bend. Everything would stop at the Eastgate freeway station. Using todays routes, this would look like deleting the 212, adding lots of trips to the 214 and 216/218/219, and extending the 208. I-405 routes that cross I-90 like the 111 and 114, along with the 566/7 and 560, would terminate at South Bellevue because of the ramp configuration from I-405 to I-90 to/from the south. The 555/6 would serve South Bellevue, and the 554 may even be deleted in favor of an all-day 555/6. With all of that said, nothing here is set in stone and both ST and KCM are continuing to study the issue. Excellent report; thanks for that. This makes a lot of sense to me. 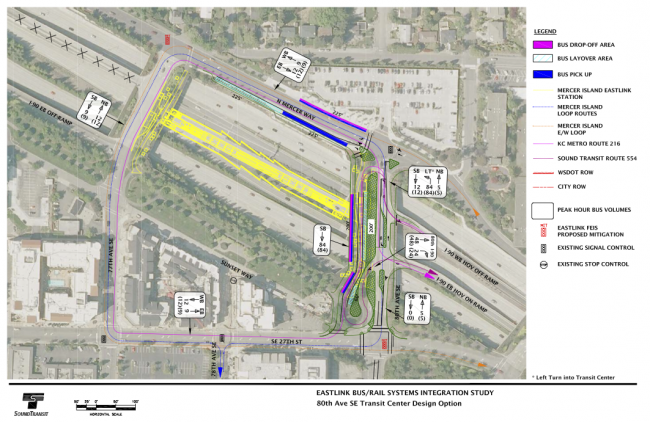 Eastgate becomes a “transit center” for the I-90 corridor. Buses will go both directions all day (I hope) rather than dead head. This mean, for example, a rider will be able to get from Lake Sammamish to Issaquah with a convenient transfer. It is too bad that the ramp configuration between I-405 and I-90 isn’t better. I see a bit of a disconnect here. A bus coming from Renton would serve South Bellevue, but buses from Issaquah would serve Eastgate and Mercer Island. This means a three seat ride from, say, Renton to Issaquah. Ideally the Renton buses would all go to Mercer Island, but even if the ramp problems were solved, you might have capacity issues (in Mercer Island). Something to think about in the long term, though. If I-90 buses fill up the Mercer Island stations, then there isn’t much point in improving the ramps. But if they don’t reach capacity, I think it would make sense to look into it. I wonder what will happen with Factoria Boulevard buses? Might more of them be rerouted to serve either Eastgate or South Bellevue (or both)? Some of them do this already, but if enough buses served both locations, it could help make the connections better. Some of these buses go to Newcastle, so serving Eastgate would make a good connection between there and greater Issaquah, Having buses frequently go between Eastgate and South Bellevue would also be good. If you took a I-405 based bus to South Bellevue, and want to go to Issaquah, you could either take the train headed to Mercer Island or take a bus headed to Eastgate. For #1, I don’t know if there’s much they could do. I think the 556 already does this. Another option would be to do what the 555 does, namely, exit I-90 at Eastgate and then have a stop at Factoria blvd, getting on I-90 there. This would have the added advantage of more routes serving Factoria, though would undoubtedly be slower as it adds another traffic light. For S Bellevue P&R, can’t they configure the intersection better? If we have the ability to create a whole transitway on Mercer island, couldn’t a similar large change happen at S. Bellevue? Yeah, Renton-Newcastle-Issaquah is a gap in the potential service pattern, but it is a gap today too. As far as I know nobody has seriously proposed any kind of direct service or providing for any kind of reasonable transfer to enable that trip. Your best bet today is the 566 or 560 to the 555 at Bellevue TC during peak, but that takes literally an hour. Off-peak, you could try the 240 or 560 to the 271 but from Renton I think its probably just as fast to go downtown and take the 554 out. The main problem is the horrible location of the Eastgate P&R; a bus heading north on I-405 would need to cross 5 lanes of traffic in less than a half mile to get to the freeway station (not happening on a bus, although I see cars pull this regularly), or else would need to exit at 148th and double back. A secondary problem is how bad N-S connectivity is through the Factoria area. This means it would be difficult to serve Eastgate with a 405 route without a large time penalty, and frankly I don’t think the market for Renton-Newcastle-Issaquah without Eastgate is large enough to warrant direct service except possibly at peak. Connectivity in this corridor is helped substantially by an all-day 555/556 because it enables transfers at South Bellevue that aren’t that out-of-direction and probably save time compared to the alternatives. It doesn’t seem like anyone has a good handle on bus capacity at Mercer Island yet. The conceptual drawings shown would provide space for about 7 loading bays and layover space for 7 more (with only the 4 of both that are on 80th in use most of the time; ST and Mercer Island prefer to only have buses using the loop through town to access the bays and layover on North Mercer way during peak), but I simply don’t know enough about bus operational practices to tell you how that and the physical configuration of the streets and ramps translates to capacity. The major different in roadway configuration is that 80th Ave SE is one of 4 crossings of I-90 in the immediate vicinity, so altering it substantially for buses isn’t that big an impact relatively speaking. Also the I-90 ramps on Mercer Island are east (Island Crest Way) and west (76th and 77th Ave) of 80th, so you don’t have a problem with traffic trying to get to the freeway. Bellevue Way, in contrast, is the major (only) N-S arterial in that area and so has significant thru traffic, is routinely a total disaster southbound during the PM peak, and dead-ends into I-90 & I-405 ramps. The only way to solve the problem would be grade separation for buses entering/leaving the station. Having buses exit I-90 at Eastgate and then slog through Factoria incurs a significant time penalty versus just staying on I-90. The 554 takes 15-18 minutes from Issaquah TC to Mercer Island, compared to the 555 taking 21 minutes from Issaquah TC to South Bellevue via Factoria (the 556, which serves the Eastgate freeway station and then does the merge across to Bellevue Way, takes only 13 minutes Issaquah TC-S Bellevue, but it is only 7 trips per day). The weave risk is clearly considered acceptable for the 556, but today that is the only route that does this. Also note that in September 2013, the former route 211 (Issaquah Highlands-First Hill) stopped serving S Bellevue P&R to save 8-10 minutes of travel time. As I mentioned before, the weave isn’t an insurmountable problem, but the volume of buses involved gives KCM and ST pause. Just for the record, I was thinking more of a Newcastle-Factoria-Eastgate-South Bellevue type route. This bus would avoid the freeways, but cross over I-90 at Eastgate. That’s a weird route, to be sure. A lot of back tracking (east, then west) but if traffic isn’t too bad, I could see it working. I’m not sure there is enough demand between these locations to justify this sort of a bus, but maybe. Factoria is a decent location (several big building there) and all the buses coming from east of Eastgate will stop at Eastgate. Plus you have Eastgate itself and Bellevue College. Again, I have no idea how bad traffic is along this section (it has been a while since I’ve worked in the area) and I think bad traffic along here could easily kill the idea. Worse case scenario, folks from Renton/Newcastle/Factoria transfer at South Bellevue, and then again at Mercer Island if they are headed to Issaquah. From the sounds of it, this is very bad connection right now, so even though this would be a three seat ride, it will be much better than the current connection (especially since buses would run more often). What you’re asking for is basically the 240, plus even more backtracking. The 240 is already slow enough as it is, so no need to make it worse. I would rather simply see the 240 revert to its pre-2011 routing and go from Factoria to downtown Bellevue via South Bellevue P&R. (It would provide local service between South Bellevue P&R and downtown Bellevue that would still be needed, even after East Link). Anyone headed from Newcastle to Issaquah can just transfer over to the 556 at South Bellevue P&R, which, would hopefully be modified to run more hours a day than it does today. Frank, thanks for the report, and I agree ST has made a very good proposal. I’ll get out the soapbox for one item, though: all of us, including my fellow Islanders, need to let go of the word “free” in front of “parking.” When downtown parking is $20+/day, parking at all transit stations with reasonable downtown service will be very attractive – and the MI Link station the most attractive of all. Water runs downhill, and parking lots near Link stations will be overused until priced so that they are not. We also need to let go of “free” in front of “I-90” but that’s a tale for another day. How sure are you that people are really insisting on free, because I’ve heard several comments at MI City Council meetings (both from councilors and from audience) suggesting that free is not obligatory. Just to be clear, I’m talking about parking, not tolling. While I personally have only limited concerns about tolled I-90 [I’d want to see some mitigation for MI educators, and some sort of low income mitigation], the Island consensus is adamantly against tolling on I-90. I meant to say, … until East Link opens. The big elephant in the room about parking is how to get the people who currently board the bus at Eastgate or Issaquah from driving directly to Link to avoid the transfer. Frequency and ease of connections would go a long way in this regard. If ST could operate a Mercer Island->Eastgate->Issaquah shuttle every 10 minutes, with a timed connection to match every train (at least during the off-peak), that would help things tremendously. Making it easier to get Orca cards would also help, since anyone who doesn’t have an Orca card has to pay twice. This would a huge issue for people coming in for Seahawks games, where the extra bus fare for the transfer would likely exceed the cost of gas for the extra driving to avoid the transfer. For normal commuting, there won’t be any space available at MI P&R, so people will want to park further out if they have the option. On the weekends, or in the evenings if there is available parking, I don’t see why someone shouldn’t drive to MI to catch the train directly. However, since parking on MI is likely to be limited, it might fill up for event service. It would be a better idea to drive to S. Bellevue where there will be more parking available and also a direct connection to the train. Wait time for the train->bus connection is going to be the key factor whether or not the transfer approach is going to work. If you can walk off the train, hop on the bus, and take off, things could work quite well. On the other hand, if you walk off the train, then have to sit around for 20-30 minutes waiting for the bus, the connection is guaranteed to be a terrible experience – whether the connection involves 20 minutes of walking or 20 minutes of waiting, 20 minutes is still 20 minutes. I would assume that almost all the buses that serve the Mercer Island station would wait for the train when leaving, especially if they are “bucket brigade” type buses. This means that you simply have to time the train, which is very easy. In other words, if the bus leaves every hour on the hour, then you take the train that arrives right before then. That is just as easy as timing an express bus (easier, in many cases, since the train will be reliable). Arriving is a lot trickier, because you can never time it just right (all it takes is one little delay). But in that case, the frequency of the bus isn’t critical, since the train will run more often. It gets much messier for buses that aren’t turning around in a station. For example, the 48 will serve the new Husky Stadium station. Should it wait there, until the train arrives? I don’t think so. There are too many people who are taking it from one neighborhood to the other, and don’t care about the train. For buses that serve Mercer Island from the I-90 corridor, this isn’t a problem (they wait). I like this design. I’ve thought about something like this in Ballard in the event that we get something like the full below grade option being considered for ST3. Running “bucket brigade” smaller buses with high frequency around the neighborhood to feed the Link station would be amazing. I’m not sure I follow you. Are you talking about the Ballard to UW route, or the Ballard to downtown route? Either way, as with most of our system, really good bus to rail interaction is essential. But I’m not sure there are many locations where a bucket brigade model (where buses turn around after reaching the station) make a lot of sense. I think in most cases, it makes sense for the bus to just keep going. For example, if ST adds a station at 130th NE, then Lake City riders will have a very fast bus trip to get to Link. But I don’t think it makes sense for buses to just turn around there (as tempting as that is). I think it makes more sense for buses to continue on to Bitter Lake. That would have the added value of a great extra connection (Bitter Lake to Lake City). I think these “bucket brigades” make more sense in suburban areas,where buses are all pretty much headed the same direction on the same corridor (in this case, that is I-90). But I do think think frequent bus service to the stations makes a lot of sense, regardless of what the bus does after reaching the station. As you stated, I would rather have fast, frequent, short routes as opposed to long, infrequent ones (and I think most people share this opinion). I’ve got no problem transferring per se- provided we find another contractor to build and maintain our elevators and escalators. Anybody want to be the one to tell passengers in wheelchairs, or with a ton of luggage…..wait a minute, exactly what? We can get away with this crap- which we really shouldn’t- along Central LINK. Because there is bus service the entire length of the route. But with absolutely no inbound buses on I-90, what’s our fallback? Back to Bellevue Transit Center, inbound on SR 520? Also: somebody count. What’s the average number of times LINK riders have to be transferred to buses per month? Or is it per week? Before we lose those ramps, might be better to get this worked out before the come down, instead of after first screw-up. Also, anybody want to tell me the affected passengers, and their representatives, won’t throw gravel into this gearbox before it cranks once? Also, as someone who has only used his aikido once when I fell down the stairs at IDS, and carried a lot of luggage on stairs-saving my life but depriving me of a generous settlement- forcing a transfer this close into town would cause somebody to trip if it were a staircase. It results in “breaking stride”- which is always inefficient. Also, no secret how I feel about taking any measure just because it will take buses out of the DSTT. With large amount of north-south buses removed, DSTT won’t be anywhere overload bus capacity. Worst is that until EastLINK opens, there’ll be no excuse for finally doing what Metro should have done these last 20 years: run that Tunnel like it was designed. That tunnel was designed to only allow half the doors to be opened at each tunnel station. Combine that with the close spacing between stations, and there is a design flaw limiting headway to not much better than four minutes. Please explain. Half the door on a 4 car Link train? A reference would be a nice touch, as ST has claimed for years minimum headways in the DSTT were 90 seconds, or 2 minutes if you count dwell time at the platforms. Also, what is the minimum headway on the floating segment of I90? Another reference would be good, as truncating ALL I90 buses at MI, on trains limited to 9 minute headways and just running a couple of cars would likely overload the ability to load and unload transferees in the peak periods. Brent, I wonder if you mean that stations should have had both a center platform and a platform on each side? Maybe center platform for boarding, and outside ones for de-boarding? I know that center platform was considered. But I think that arrangement takes a slightly wider right of way- available only at Beacon Hill, Stadium and Rainier Beach. Center platform would also have made it impossible for buses to pass each other. Rail subway systems generally have switches in away from stations to get trains past blockages. I’m pretty sure that every station is designed for a train of four 90′ units. But it would be completely correct to say that by ordering Tunnel hybrids with only two doors instead of the three on the Bredas- which the Rapid Ride buses still have- Metro cut door width by a third. And the County’s decision to use only front-door boarding re: fare collection effectively made a one-door bus out of a former three door sixty foot bus a hundred percent certain to be used for heaviest possible service. Headway prediction? So far, good example of reliability of present testing mode was the one that showed that adding fare-box bus boardings would not interfere with service. Whose accuracy was affirmed by Metro’s decision to add two minutes to every Tunnel schedule. So for buses, trains, or joint-use, until the system runs even one operations test using real people representing passengers instead of relying on computer models and passenger-free imitation boardings- we really don’t know. I doubt we’re only using half the doors on LINK trains- just on buses. But a fully reliable test would have to include a few months’ practice under the level of communication, control, and training that should have been in place the last nineteen years. Whatever the door-count. Because today’s headline about events Under the Waterfront- too bad Marlon Brando’s not around anymore- make my case for treating joint use like we think it will be around for awhile. ‘Cause it COULD still be a contender! I mean the doors on only one side of the train, when an exit-only center platform could have cut dwell time by as much as half, or made nice and easy transfers between East Link and South Link, saving a couple minutes off of close to 1/9 of all trips. Width is a minor concern. Renovation costs have been cited as a higher concern, and I beg to differ with the engineering department’s cost analysis on that one. The idea of the center platform was dismissed too early on in the analysis, and I think there are huge logical errors in the reasons I have been given. I agree that escalators and elevators can be a problem and should be avoided if possible. It looks like this would be really difficult to build in a way that allows cross platform transfers, though. You wind up with passengers having to cross a bus lane or track, or a pretty radical reconfiguration with the buses having to be in the place of the center tracks and the tracks pushed to the outside so that westbound bus passengers can just get off, walk across the platform, and get on the westbound train. The configuration just gets much too complicated in the space available. Maybe hope for a nice, long ramp so that if the elevator ever goes bad there at least is an unpleasant but workable solution. FWIW, the long ramp at MAX Clackamas station is faster at a flat out run than either the elevator or the stairs. A really good cure for elevator problems would be to buy, install, and maintain these facilities for highest possible quality. But especially for Mercer Island, long, shallow ramps would be an excellent non-mechanical backup for passengers who can’t use stairs. On the weekends after 7pm, East Link riders traveling from downtown to Eastgate and beyond will have to wait up to an hour for the 554. Does anyone know, will there be a nice enclosed waiting area with comfortable seats at Mercer Island Station for transit users to wait for long, multi-mode journey back home? I’m assuming those times will get part of the beefed-up 554 service other commenters and previous posts have mentioned. Though, even every-half-hour service will still require significant waits. Once significant bus routes are truncated, whether at Montlake, Northgate, or Mercer Island, ST should publish a Link schedule with promises that the next train departing after such-and-such time will make the bus connection. Metro’s route 107 to Rainier Beach Station … still 1 hour headway on weekends after 7pm. Yeah, increased frequency on the bus makes sense. Also keep in mind that the train will travel fairly frequently and the bus will be there to greet it (if you take the right train). So you could time your trip to minimize the transfer time. In other words, with a schedule in hand, you can figure out when the Issaquah bus leaves, and either wait downtown (in a tunnel, where it is warm) or on Mercer Island. Or maybe you don’t wait inside the tunnel, but simply wait wherever you were in downtown. Leave to catch the appropriate train just as you would leave to catch the appropriate bus. Also, I would ask for this with ST3. Metro is Metro and ST is ST. Adding lots of hours of extra Sound Transit express service is possible and would be (in my estimation) quite popular. As it is, for these routes you could add lots of extra service at no extra cost once East Link opens. Buses will save a lot of time by not going to (and through) downtown Seattle, and that should easily transfer to more frequent service (along with new routes, etc.). Hour-long waits for the bus after 7 PM, the transfer is hopeless – everyone who might possible leave downtown after 6:30 or so will just drive to the train, if not all the way downtown, to avoid the hour-long wait. Getting extra frequency on the connecting buses all day, for the full span of Link service, is an absolute must. Even though achieving the necessary frequency might entail fewer passengers per bus that what today would be considered acceptable. As RossB pointed out, the truncation alone, would buy money for a significant frequency bump. If that’s not enough, ST 3 could be used to bump frequency even more. And because adding more buses is much faster than building rail, frequency improvements to the 554 funded by ST 3 could go into effect the day that EastLink opens. This would be a much better investment of funds than constructing a whole new rail line. The ultimate goal should be a bus for every train, all day, seven days a week, for the full span of Link service. I agree that’s the ultimate ideal. However, are you saying that (on weekend evenings) an every-hour connecting bus is even worse than the every-hour bus we currently have today? If transfers are guaranteed and it’s advertised which train will have the transfer, I view that as no worse than the current situation. People can wait downtown for the train only a block or two from where they currently wait for the bus. Yeah, what William said. The bus will be timed for a particular train. Either Sam really hasn’t thought out what taking a bus like this means, or he is trolling. There is no reason to wait in Mercer Island unless you want to wait in Mercer Island. This is no worse than the current situation. In fact, it is better, because at least you have the option of waiting in Mercer Island. This is a great report, and I really like the bucket brigade analogy — that is new to me. I think this model serves the linear suburbs quite well. Not only does it provide fast service to the big city (in this case Seattle) but it also provided very good suburb to suburb support. I am curious as to how this stacks up against Lynnwood, because I think they are very similar. In many ways, Lynnwood is even better for this type of thing. I have a question about the drop-off and pickup areas. With the 554, for example, will the drop-off area be on 80th, but the pickup area will be on North Mercer Way? Or will both drop-off and pickups be on N. Mercer Way? Or both on 80th? Also, why will the 554 be truncated at Mercer Island, but the 577 isn’t truncated at SeaTac or TIBS? All-day service, including the 554, and most peak service would drop off and pick up on 80th. The westbound stop on North Mercer Way would be used by Mercer Island local service (the 201 and 204) and the eastbound stop would be used only during peak by an I-90 route. The 554 would be truncated because it would be no faster (and sometimes slower) than taking the train into downtown Seattle. The trip downtown on the 577 is faster than if you truncated it at SeaTac or TIBS and forced a transfer. The south line has the 10-minute Rainier Valley overhead. That’s why the 577 isn’t truncated. Truncating the 577 at SeaTac would make it slower because when Link and the 577 leave downtown simultaneously, Link reaches SeaTac right when the 577 is pulling into the Federal Way exit. I think there will be lots of congestion from kiss-ride at this station. Transferring Mercer Island local bus frequencies will mostly be low, parking will be either tight or expensive, and the Mercer Island demographics are such that someone else in the household will have a smart phone and will likely be available to drop off or pick up someone on Link. I think that this will be even more pronounced should I-90 tolling begin, and will be more pronounced because of the appeal of rail over today’s express buses. This sketch looks very “clean” on paper but I think the kiss-ride activity will gum up local traffic and buses in the real world in ways the site planners may not be fully preparing for. The kiss-and-ride is planned for the west (77th Ave SE) entry, and has been throughout the station planning process dating back prior to the bus intercept planning. The entire bus circulation area on 80th Ave SE would be bus-only, although thru traffic on 80th would be permitted. The current park and ride can also be used for kiss-and-ride purposes. Idea. You know those signs at parking garages that say “lot full” or blank number of spaces left? They should put up some electronic signs on I-90 westbound, before the Mercer Island and Bellevue Way exits, to let drivers know before they actually take the exits to get to either the Mercer Island P&R or the S. Bellevue P&R, that says if there are any parking spaces left or not. It will save drivers quite a bit of time and fuel driving around searching for parking. Improving on your very good idea: Put them before the Eastgate exit, too. The main problem with the 554 is the location of the Issaquah Transit Center. The bus has to go out of its way several blocks and traffic lights and congestion to reach it, and it’s in the middle of nowhere so you can’t walk to anything. Everyone going to downtown Issaquah or anywhere else in Issaquah has to go through that time-consuming detour. Is there anywhere else the P&R could be moved to? That would cost money but it’s the biggest thing that would improve Issaquah transit. Issaquah and WSDOT have conceptual and unfunded plans for an overcrossing of I-90 at roughly 12th Ave NW which would provide for HOV direct-access ramps. This would obviously require extension of the HOV lanes which currently end just west of SR 900. However, this would enable buses to utilize 12th Ave NW, which is generally much less congested than SR 900. Adding an overcrossing of I-90 could change that, however, so then you’re right back to buses slogging on SR 900. Some better transit signal priority on SR 900 could help in the near-term. RossB upthread mentioned the idea of a transit station in the I-90 median around SR 900. The ROW on I-90 definitely exists for something like this although the median at SR 900 might be a bit tight without moving the freeway lanes out a bit. Pedestrian connectivity on SR 900 is pretty bad too; there is literally nothing fronting SR 900 because of drainage ditches which are considered wetlands (the sidewalk is actually a boardwalk over these), and crossing I-90 is pretty terrible. There is a relatively new pathway on the west side crossing I-90, but no path on the east side. At the Gilman Blvd intersection, there is no crosswalk on the north side leg, requiring going around in a U through the other three legs of the intersection. Because it is a state highway, don’t expect this to change soon. Moving things over to 12th Ave NW isn’t a bad idea; there’s a lot more in walking distance and the street isn’t a highway. As part of an ST3 package a median transit station combined with an overcrossing at or around 12th could be a great way to improve transit in Issaquah as well as improve I-90 corridor service. Wouldn’t using 12th rather than 900 require skipping the P&R? No. Outbound buses could exit at 12th, right onto 12th, right onto Newport, right into the transit center, then right onto Maple and continue straight onto Newport to the current route. Inbound buses would follow the current route to the transit center, then right onto Maple, left onto 12th, left onto the freeway. I suppose you could choose one direction to make the idiotic loop-de-transit center outbound service currently has. It is possible to make a left into the TC from Maple, but it is close to the Maple/SR 900 intersection and KCM & ST seem to avoid this turn. This would allow use of the east side of the island platform at the TC without a loop-de-transit center. Or worst case, you could take a left from westbound Maple onto SR 900 and then immediately left into the TC using the dedicated bus turn lane and signal and proceed to loop around… nah, that’s too stupid even for KCM & ST. Overall serving the TC is a bit of a backtrack, sure, but if you choose the right routing and it is faster than SR 900, then it is a win. >> As part of an ST3 package a median transit station combined with an overcrossing at or around 12th could be a great way to improve transit in Issaquah as well as improve I-90 corridor service. Yeah, I agree. Very good idea. That gives you a lot of great options for serving Issaquah very well, without breaking the bank. This is only really a problem for people originating from Issaquah Highlands or Sammamish. During the peak, they have special route available that bypass Issaquah. Off-peak, there simply isn’t enough ridership to justify the separate bus, let alone rebuilding the transit center and giant parking garage a few feet closer to the freeway. One potential option could be to split the 554 into two routes. One would go Mercer Island->Eastgate->Issaquah TC->downtown Issaquah. The other would go Mercer Island->Eastgate->Issaquah Highlands P&R->South Sammamish P&R. The two route could combine for 10-minute headways to Eastgate (a bus for every train), with 20-minute headways (a bus for every other train) to Issaquah and Sammamish. The existing connection between downtown Issaquah and Issaquah Highlands could be maintained by extending a local route, such as the 271, rather than through Sound Transit. This could all be done with no fancy construction over what we have today – just more service hours. I think that makes the most sense right now (split the routes and just add a local connector). In the future, you could add that overpass station, which would avoid the worse part of SR 900 traffic (which apparently is an issue). It would also reduces the need for the local connector, but as you suggest, it is hard to justify building the overpass just for that. It’s not just the Highlands; it’s to bring the bus closer to the rest of Issaquah. Currently there’s no place you can live within walking distance of the 554 except a few buildings downtown, and even then you have the several-minute overhead of riding to the transit center and back. Then it skips the dozens of apartments between downtown and the Highlands but that’s another problem. Only not really: the reluctance to add a stop is probably due to the travel-time overhead caused by the transit center. It’s just wrong to have no way to live in Issaquah without driving — except for the Highlands. Actually great bus-rail transfers are where you don’t have to cross a street and is less than 50 ft between the vehicles. Better yet, the buses enter the actual rail station building on their own level… Toronto, Boston, Philadelphia and even Atlanta have great examples of this.